Are you getting more than a little concerned about your thinning hair? Are you starting to feel the emotional impact of losing your hair? Is the condition getting in the way of your social and professional life? If you answered ‘yes’ to any of these questions, it is high time for you to find the most appropriate men’s hair replacement procedure that can help you solve your hair problems. If you live in or near Connecticut, you may be glad to know that there are a lot of hair restoration options available at the DiStefano Hair Restoration Center that may help you solve your hair problems. Here are some of your options. OTC drugs. Anti-hair loss medications such as Finasteride (Propecia) and Minoxidil (Rogaine) can help reduce the severity of hair problems and promote hair growth. This is a great option for those who catch their hair loss early. Low Level Laser Technology. The FDA-approved laser comb and clinical laser therapy is another men’s hair replacement procedure that can be used to reduce the severity of hair loss. This technology encourages hair re-growth by stimulating the blood flow to the balding areas in your scalp. Cell Therapy. While this procedure was previously restricted to cardiology and plastic surgeries, cell therapy or Platelet Rich Plasma (PRP) is now being used for hair restoration purposes. PRP therapy is a revolutionary technology by which a small amount of your own blood is centrifuged to separate the growth factor proteins. These proteins are then applied to your scalp to increase blood flow and awaken dormant hair follicles. Hair transplants. With the DiStefano Hair Restoration Center, you can choose from among a number of hair transplant procedures available which includes follicular unit transplantation (FUT), individual graft technique (IGT) and Total Crown Renewal (Frechet Triple Flap). 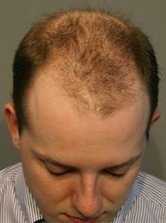 Needless to say, there are a lot of options that can be used to help stop hair loss in its tracks. All you need to do is to know which one can best suit your needs. To do this, you may want to consider calling the DiStefano Hair Restoration Center to schedule a free consultation with the best people in the industry. Previous PostPrevious Hair Loss Restoration and Your Age: Why Does It Matter?